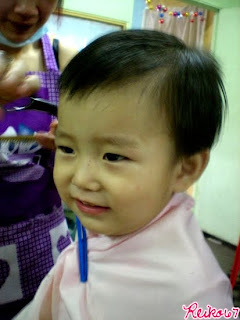 Finally bring Xuan Xuan to cut his leng zai hair last Wednesday, at a aunty-kind of hair salon. LOL! 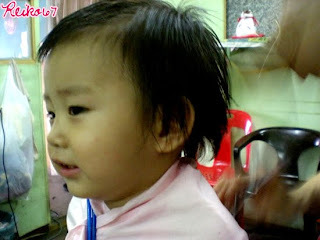 The last time I bring Xuan Xuan cut his hair was 1 years+ ago! We waited almost 1 hour+ in order to get our hair cut. There's a lot of customers by the time we get there and customers come and go all the time while we are there. Maybe this aunty's hair cutting skill is good. Finally our turn! 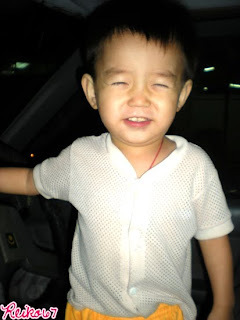 Of course, Xuan Xuan first. Haha. Ok, got my new clothes, shoes, hair cut... Am thinking of dyeing my hair. Still hesitating. Have very, very tight budget for this coming new year. Plus Qi is coming back to Malaysia, which means outings = money spending. Gosh~ I need to find more freelance job. Anybody, if you have anyone who is searching for Usherettes/Show Girl/Part-time Model/Freelancer with good pay, email me ok? P.S: I've sent soooooooo many emails out these past few weeks but hardly got any responds. Sigh!!! how much did aunty charge your hair cut? 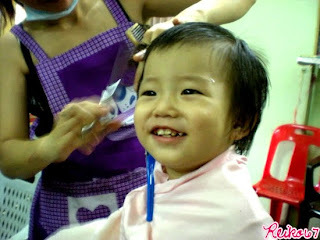 xuan xuan gets hair cut once a year? 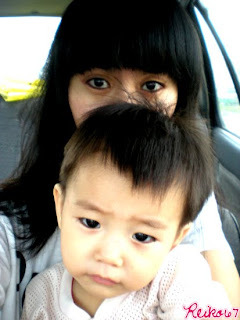 no wonder he so lengchai..
Me and Xuan Xuan together RM20.